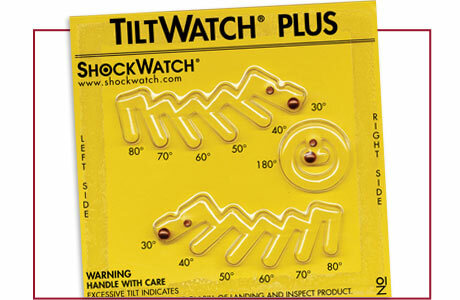 ShockWatch tilt indicators affix directly to your products or packaging to detect and record unacceptable tip events for goods that must remain upright. 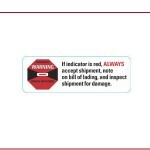 These tilt indicators are simple to use, cost-effective, and highly effective deterrents to product mishandling. 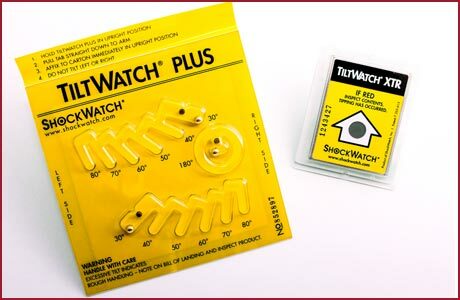 When used with ShockWatch companion materials, our tilt indicating solutions become highly visible deterrents to product mishandling. In the event of mishandling, these tamperproof tip sensors deliver indisputable evidence of tilt events, ensuring chain of accountability for all product handlers. 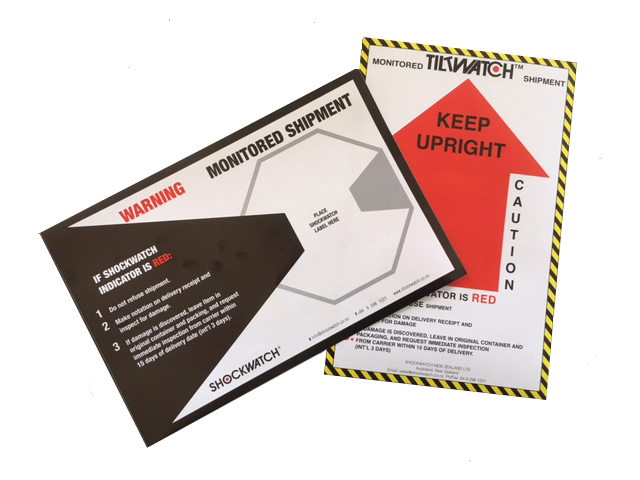 ShockWatch condition-based solutions promote safe handling from dock to dock, increasing customer satisfaction and providing a marketing edge. 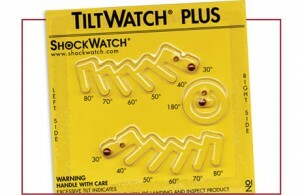 Tiltwatch XTR: Turns red if the package it is affixed to is tilted past 80° or is completely up-ended. However, it remains unaffected by movement due to normal handling conditions. Tiltwatch Plus: Provides 360° monitoring. It indicates the exact angle of tilt or whether complete overturn has occurred. 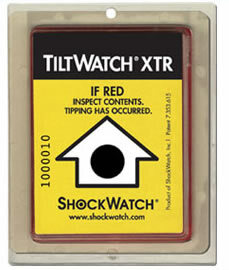 TiltWatch® XTR turns red if the container it is affixed to tips on its side. TiltWatch will not activate under normal handling conditions or with random vibration. 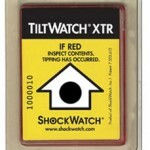 The TiltWatch XTR is a single-use tip indicator used to monitor goods that must remain upright to insure intact delivery. The device continually monitors shipments and does not activate until it is at an 80o angle +/-5% from vertical. 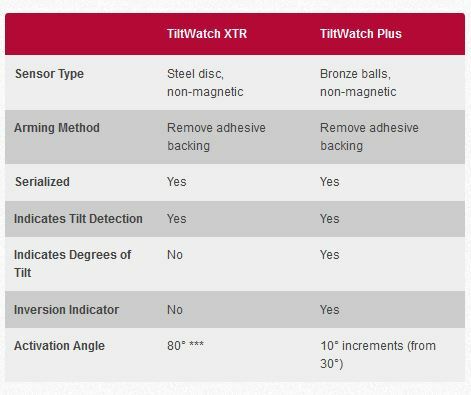 The TiltWatch XTR is “carrier friendly” so no false activation will occur with normal handling or vibration. Even more important than its accuracy, however, is the inherent and easy to interpret message: Don’t tip this shipment over. Installation: Pressure sensitive adhesive – and/or holes for small screws, nails or staples for rough wood surfaces. Customization: Private logos available on orders above 3500 units. TiltWatch® Plus provides 360° monitoring by incorporating three separate tip sensors — two that determine the angle and direction of tilt (left or right), and one that indicates whether complete overturn has occurred. Attach the TiltWatch Plus directly to a package’s exterior surface to monitor the ‘care in handling’ of any shipment or other product movement situation. Applied in the same fashion as a ‘peel and stick’ pressure sensitive label, the TiltWatch Plus tip sensor is actually three separate registers in a single tilt indicator unit. Together, the three registers of a TiltWatch Plus tilt indicator unit provide inexpensive 360° tilt monitoring for the entire duration of shipping transit and an unalterable record of damaging excesses. The TiltWatch Plus will not activate during normal handling conditions, such as take-off angles.